SAN FRANCISCO, CA--(Marketwired - Nov 2, 2017) - Bossa Nova, the leading developer of autonomous service robots for the global retail industry, announced today that it will test its robots and data services in 50 Walmart stores across the U.S. Bossa Nova robots capture images of store shelves and use AI to analyze the data and calculate the status of each product including location, price, and out-of-stocks (see video here). The information helps Walmart manage merchandising tasks and the process of restocking shelf inventory. "Access to data is the foundation of a truly seamless omnichannel retail business," said Martin Hitch, chief business officer at Bossa Nova. "Our solution provides visibility into on-shelf inventory and helps the retailers improve store operations to better serve their customers, whether in-store or for online pickup. Walmart is retail's innovation leader and we're excited to be a part of their advanced technology initiative." Bossa Nova first deployed its autonomous robots in retail stores in 2013 and has since registered more than 710 miles and more than 2,350 hours of autonomous inventory scanning, capturing more than 80 million product images, which feed AI algorithms to give the retailer data they need. Terabytes of data and extensive field operations position Bossa Nova as the leading developer of service robots for the global retail industry. "We have worked closely with Bossa Nova to help ensure this technology, which is designed to capture and share in-store data with our associates in near real time, works in our unique store environment," said John Crecelius, vice president of central operations at Walmart. "This is meant to be a tool that helps our associates quickly identify where they can make the biggest difference for our customers." 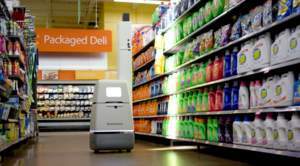 Bossa Nova creates autonomous service robots for the global retail industry. The Bossa Nova technology and services empower retailers to make informed inventory decisions and take rapid action by automating the collection and analysis of on-shelf inventory data in large-scale stores. Retailers can therefore improve their productivity and create a better shopping experience. With a multi-disciplinary team of robotics, computer vision, artificial intelligence, and big data scientists, Bossa Nova has solved the challenges to deploy fully autonomous service robots in busy and crowded environments. For more information, please visit Bossa Nova. Bossa Nova robots scan store shelves and use AI to analyze the data and calculate the status of each product including location, price, and out-of-stocks.